It's a quandary shared by adventurous and indecisive drinkers alike: What should I drink tonight? Here to answer that question is Be Your Own Bartender . Through more than a dozen flowcharts, the book poses a series of questions designed to lead readers to their ideal drink. With more than 151 original recipes, there's a cocktail for every mood, taste, and occasion. Are you after something tequila-based or gin-based? Do you like gin or really like gin? Are you ready to break out the muddler? And is your night winding down or just getting started? Whatever the answers, Be Your Own Bartender leads you to your destination—a cocktail effectively designed just for you. With some drinks that are truly adventurous and others that are friendlier to the cocktail novice, every recipe is created with the home bartender in mind. 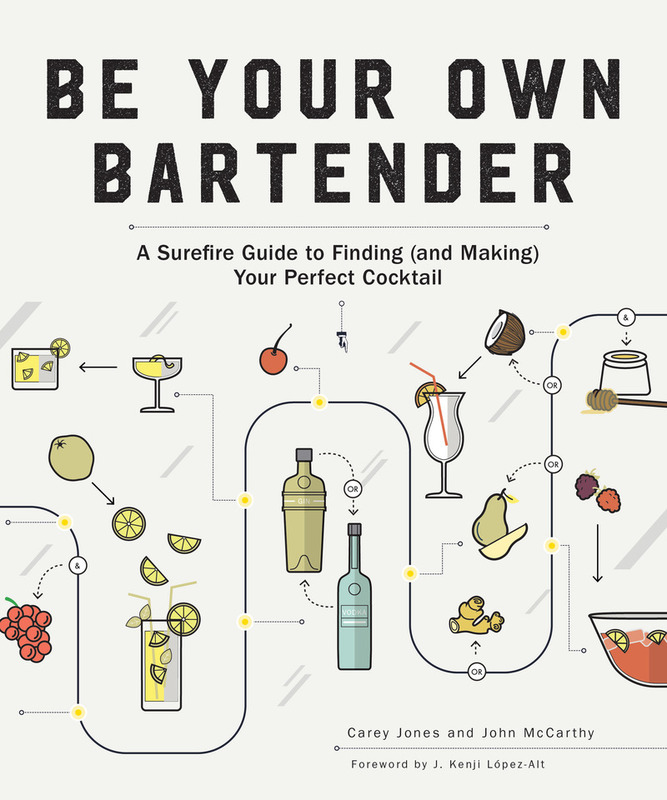 Divided into chapters by spirit—with bonus flowcharts for brunch drinks, holiday parties, and true cocktail nerds— Be Your Own Bartender is the best way to discover the perfect cocktail for you, in a journey as user-friendly as it is fun. Carey Jones is a food and spirits writer for publications including Food& Wine, Travel + Leisure, and Vogue and has appeared as a cocktail expert on NPR’s Dinner Party Download. Her first book, Brooklyn Bartender, has been featured by Saveur, Forbes, and many others. Jones is the former managing editor of the James Beard Award–winning website Serious Eats. John McCarthy is a consulting mixologist and spirits writer who has created bar programs for establishments in New York, Nantucket, and beyond. Together with Carey Jones, he is the co-author of “Liquor Cabinet Roulette,” a weekly spirits column for the home bartender on the Food& Wine website. McCarthy has been featured in a series of cocktail videos for Saveur; he and his cocktails have been profiled in The New York Times, The Wall Street Journal, and other publications; and he has appeared on-camera on Fox& Friends, Good Morning America, and Today.com. J. Kenji López-Alt is the Chief Culinary Advisor of Serious Eats, Chef/Partner at Wursthall, and the author of the James Beard Award-nominated column The Food Lab. His first book, The Food Lab: Better Home Cooking Through Science is a New York Times bestseller, winner of the James Beard Award for general cooking, and was named Book of the Year by the International Association of Culinary Professionals. He lives in San Mateo with his wife Adriana and daughter Alicia. For more information visit www.kenjilopezalt.com.